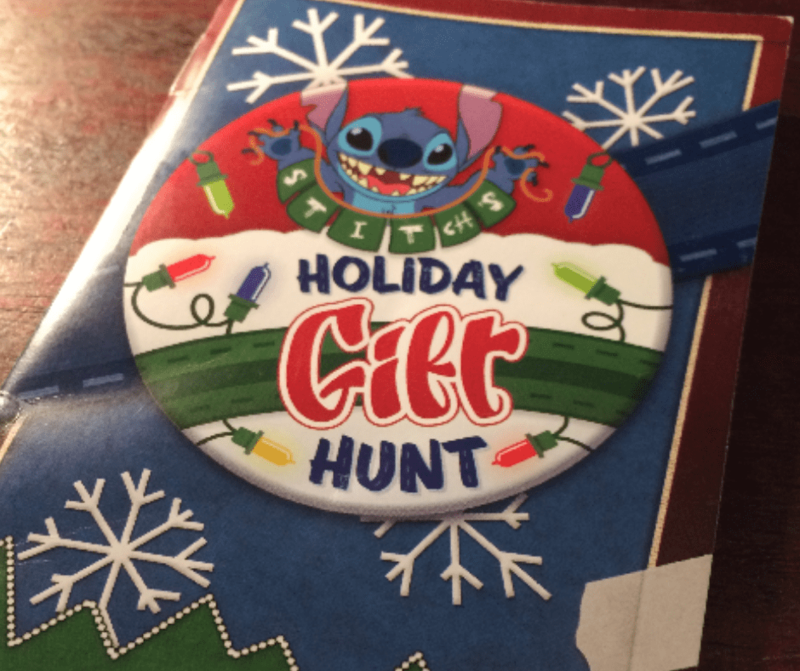 If you’re looking for a holiday button at Disney World, Stitch’s Holiday Gift Hunt Button is definitely a rare find. We luckily came across a Photo Pass photographer at Disney Springs that gave us information on how to get this special Holiday Button. This post contains affiliate links, which means I receive a small commission if you make a purchase using these links. It is no additional cost to you, and I cross my heart I only recommend products and deals that will help you get the most out of your Disney experience. It was Stitch’s Holiday Gift Hunt!! which made it even more fun! The goal was to head around to 10 different stores located at Disney Springs and find where Stitch was hiding!! Once you found him, Stitch was holding an item that matched the stickers in the book. After matching all the hidden Stitch’s to their sticker items there are locations listed at the front & back of the passport directing you to where you can pick up your Holiday Stitch Button. It was a fun scavenger hunt and definitely worth the button. Everyone asked us where we got it, including cast members, so it made us feel extra magical!!! ~ Some of the stores did an amazing job of hiding Stitch! If you can’t find him just ask one of the cast members to give you a little hint…they love playing along with you! ~ You can pick up your Stitch’s Holiday Gift Hunt Passport at Guest Relations. ~ Available November 6th, 2018 – January 6th, 2019. Enjoy Your Magical Holiday Scavenger Hunt! Subscribe Today to Receive Weekly Disney Travel Tips via Email! !